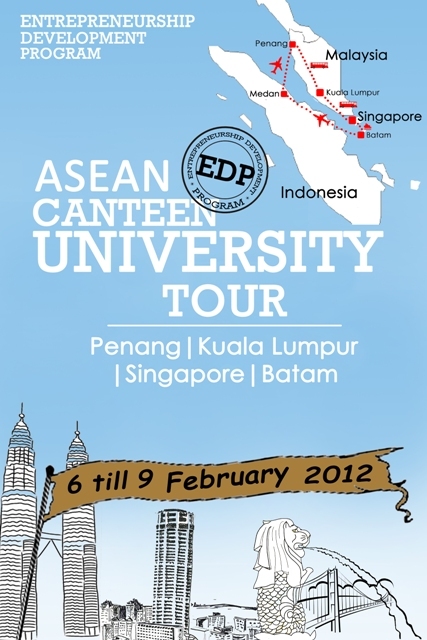 KaFE baga Entrepreneurship Development Program plan to hold 'ASEAN Canteen University Tour 2012' (EDP A-CUT 2012). The tour are scheduled to visit the library and canteen's university in Kuala Lumpur, Singapore and Batam. i.e. Universiti Kebangsaan Malaysia (UKM), Universiti Putra Malaysia (UKM), Multimedia University, National University of Singapore (NUS), Nanyang Technological University of Singapore (NTU), and Universitas Internasional Batam (UIB). EDP A-CUT are intended to open the student's horizons by knowing more the universities in neighbor countries and to develop their entrepreneurial talent. Students of Faculty of Economics, USU who interested to join the tour, please contact us. For trainee of KaFE baga and canteen Femi USU, we will give you our special support. This tour is about identifying, valuing, and capturing opportunities. Join us!